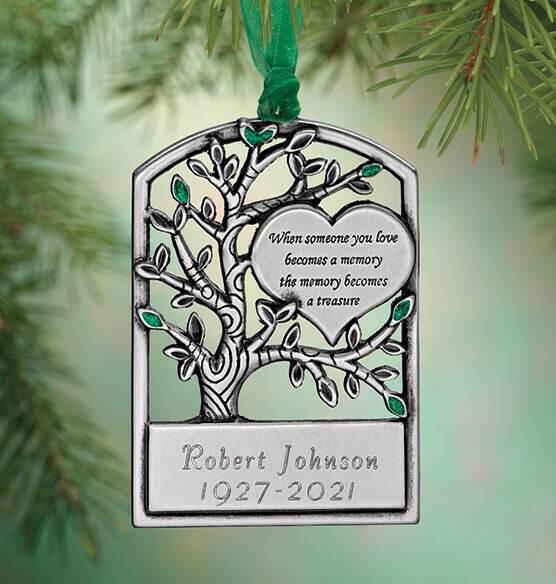 Keep your loved one’s memory close at Christmas with this personalized pewter memorial tree ornament graced with heartfelt sentiments. Pewter-finish metal. 2 1/4" wide x 3 1/8" high. This ornament will be lovingly engraved. Specify name and dates; limit 2 lines, 16 characters/spaces each. These 4 ornaments for our parents were superb. It's nice we now have ornaments to remember them by. These are quality and I would buy them again! I ordered this as a memory of my father. It hangs in my kitchen window. Please carry this year round as a sympathy gift. It is currently unavailable! Please bring it back! Very nice item to keep my brother in our memories. Very nice item to remember a family member that recently passed. Very classy. Will keep out year round. Got one for myself and 2 more as gifts, everyone is very pleased with this. A wonderful keepsake to remember a departed loved one. The Memorial Window as I call it looks great in my Christmas Tree. I was able to slide them over my white lights so that they could shine. A nice keepsake to honor a loved one. I bought this as a Christmas ornament to memorialize my mother in law who passed this year. I was impressed with the originality of the design and the sturdiness of the ornament itself. Green was my mother-in-law's fave color and she had a large family...perfect. Her children loved the design and personalization! Will probably be reordering more soon. My Sister-in-law passed away this year, my husband and I gave these to our family members as a keep sake. We were very pleased with them they are beautiful. We were even able to put her nick name on the bottom line. Most of our family members said they will keep it displayed all year round and at Christmas place it on the tree. This is everything I was hoping for!! My wife loved it and had tears in her eyes when she saw it! This beautiful ornament brought comfort to our family this Christmas after losing my dad/grandfather in January 2014. I will keep it hanging throughout the year. A perfect way to show a loved one that you care what they are going through. A beautiful way to remember a loved one especially at Christmas. The couple I gave this to had suffered a loss of a parent and a grandparent within one week of each other. This was a great way to show them that I am there for them, and that their family member that has passed will always be with them. They loved it. What a touching,thoughtful gift ! I gave 8 of the pewter ornaments to family members who have lost loved ones. It meant so much to each. This made my best friend (whose grandmother recently passed) cry tears of joy when she received it. It was so special to her, and small enough that she can take it wherever she wants. A great memorial gift. I sent this ornament to my deceased son's fiancee. She touched by it and thanked me for sending it to her. Bought this for close family and friends of our son we lost earlier this year to tragic accident. It looks very nice. Great Memorial piece. I bought this in memory of my father in law. It is a beautiful ornament. These are beautiful and make a special gift for someone who has lost a loved one. The personalization makes them so special. Beautiful ornament. Very pleased with the quality of the piece - feels solid; should last for years. Also, the engraving turned out very well. While I purchased this as a Christmas tree ornament to keep my Father part of our celebrations - it could certainly be displayed year round. I had some of these made in memory of my father. I was very impressed with them once they arrived. Remembered every holiday with this beautiful ornament. I purchased a personalized ornament for my Christmas tree and also one for my brother in law due to the death of my sister in 2016. These will be on our Christmas trees as a welcome remembrance of her life. I have now purchased my 2 brothers and my dad for my tree every year. Very good quality ornaments. They are all very important to me and will be for life. Wonderful memory of a loved one. I found this for the mother of a twenty-one year old who died suddenly.i found it to be the perfect memento for her. I have bought dated ornaments since my husband and I got married. However, this year he passed away and I was looking for a special way to remember him. I ordered five memorial ornaments for my family for Christmas this year to remember our sweet Grandmother who passed in the spring.They are BEAUTIFUL! One was damaged in the engraving area and they replaced it NO PROBLEM! Miles Kimball handled the situation quickly and with amazing service! Life time customer for sure!! Thank you for helping keep our Grandma's memory alive during the HOLIDAYS! It means so much! Great addition to our tree in memory of our loved one we lost this year. Nice, sturdy, good reminder of lost one....but I wish they allowed more space for the the full name and full dates, not just the years. It is a beautiful ornament but the engraving needs to be deeper/darker to be able to see it. Ornament was beautiful and well made. The engraving was a bit too light and hard to read.